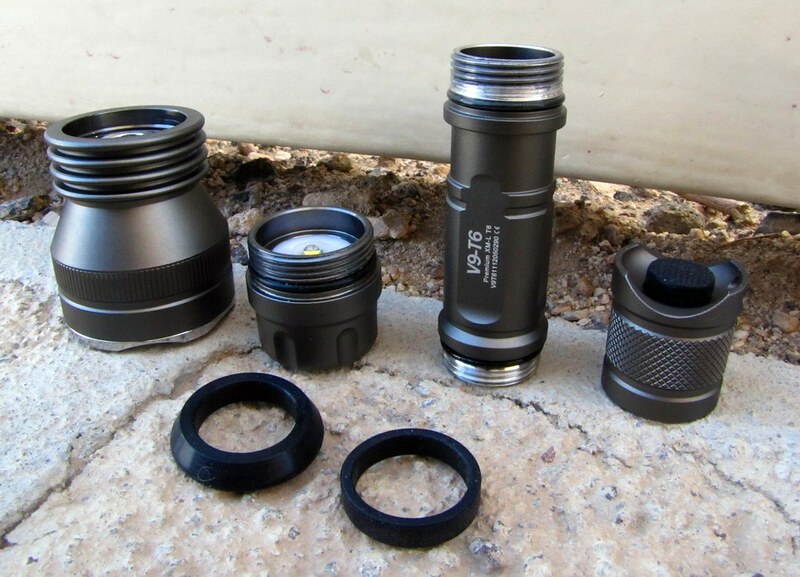 Say what you will about Int'l-Outdoor but you have to admit; Hank's collection of flashlights are some of the hottest designs available anywhere. Being P60 satiated for quite some time and, not finding the necessary change and variety at my old stand-bys (Solarforce, Manafont, etc.) Foy goes to Nanjing, China. 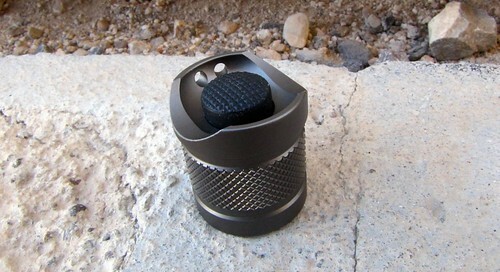 Hank's site is a feast of very desirable torches, from the average to the extreme and beyond. 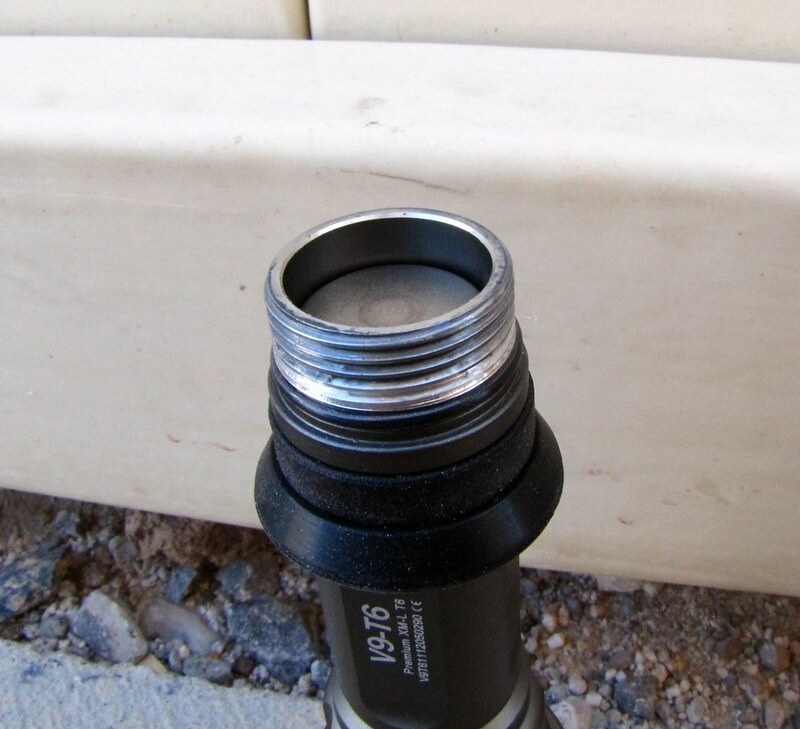 There's a cozy buyer-seller connection at Int'l-Outdoor that simply does not exist at other Chinese sites, no matter how sunny, warm and shallow their shills' posts are. 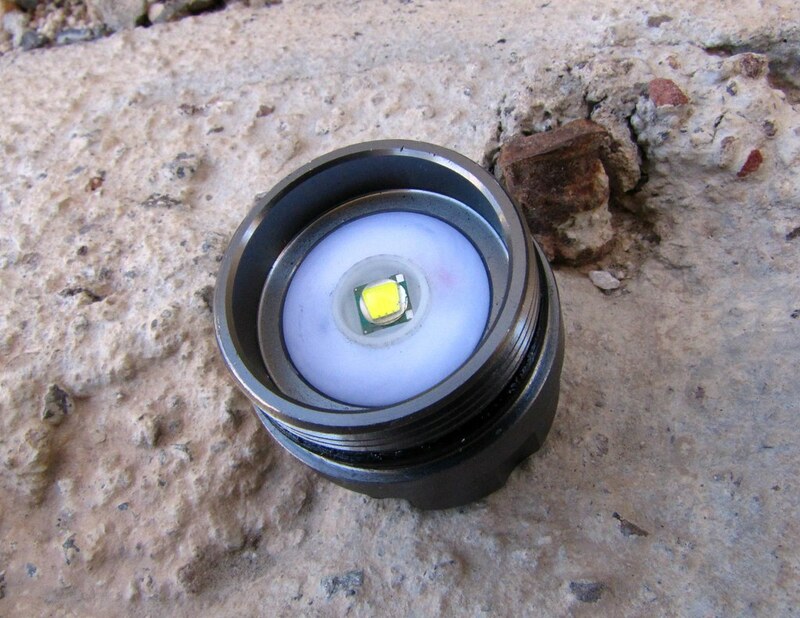 (What types of LED lights you are happy for in camping expidetion? 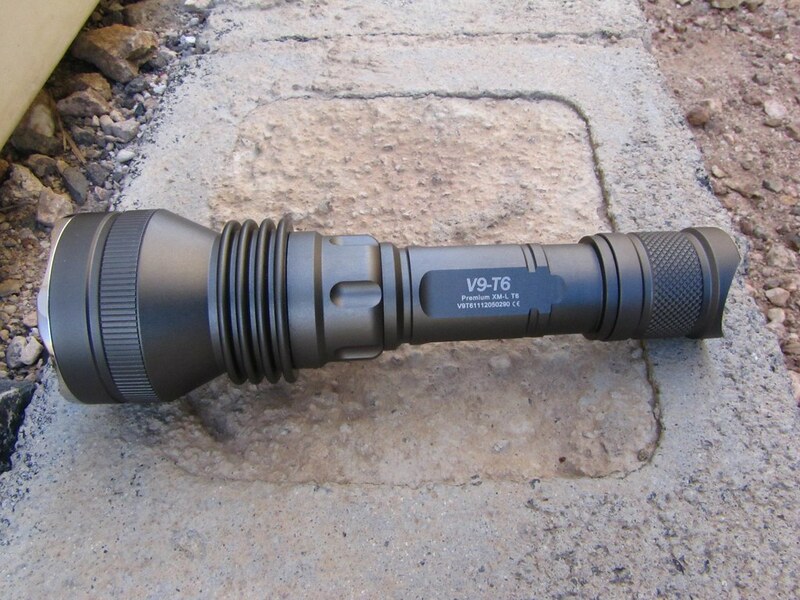 I want to make friends and I love BLF>) I can honestly say that my desire for something different is so far being met, the latest of which is this fine looking Crelant V9-T6 by Tiablo. 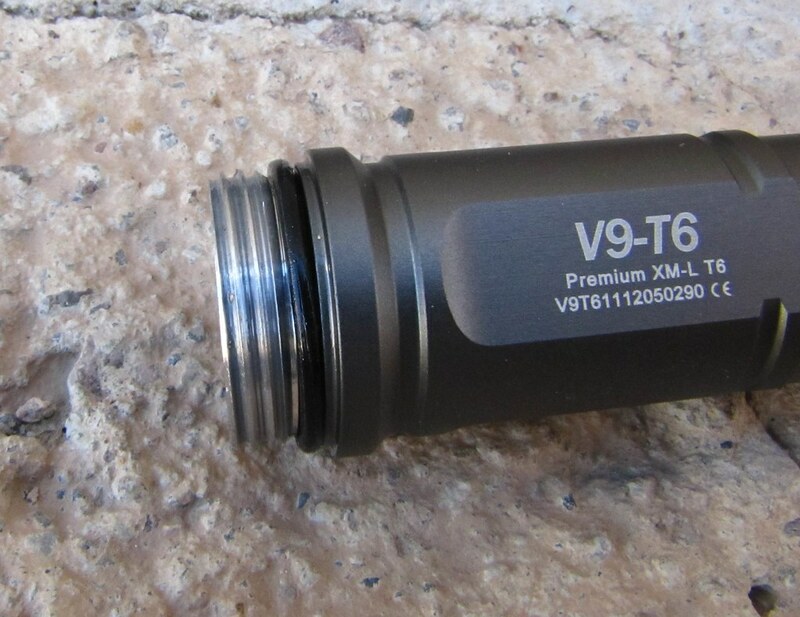 I ordered the V9 for one reason and one reason only; I simply liked how it looked. 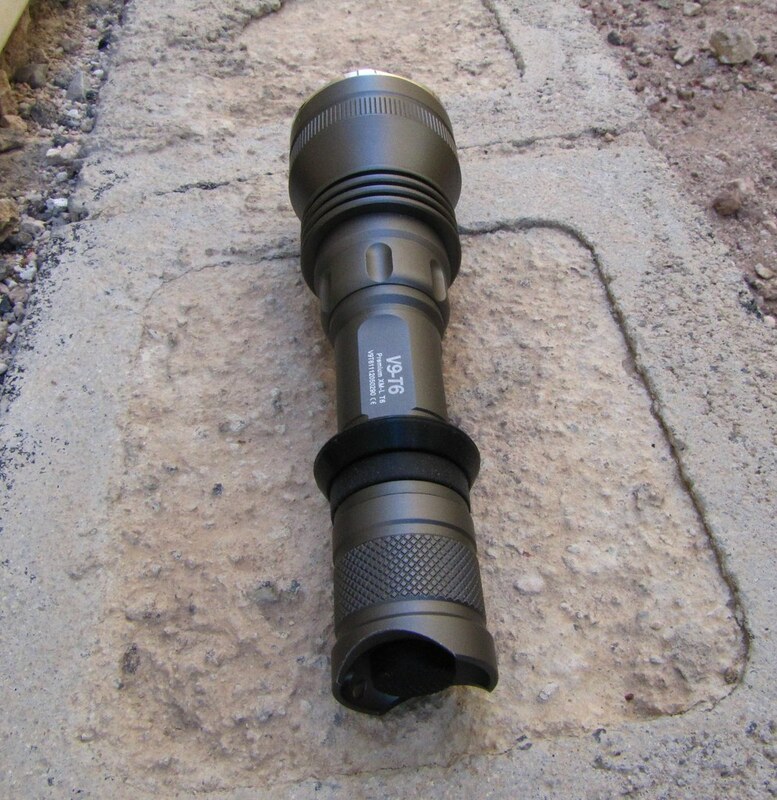 But is it a good flashlight? A qualified . 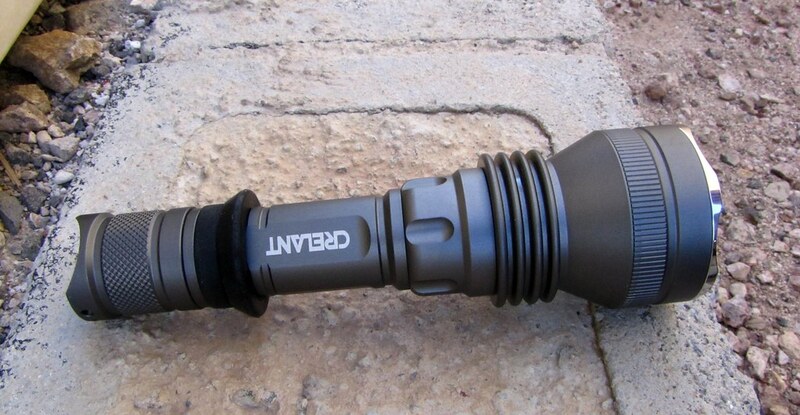 . .
Bottom line: The handsome Crelant V9-T6 is a good flashlight. It has no glaring weaknesses but its performance is merely adequate. It has above average quality, a spectacular exterior finish, a superb beam profile and of course, it is very good looking. 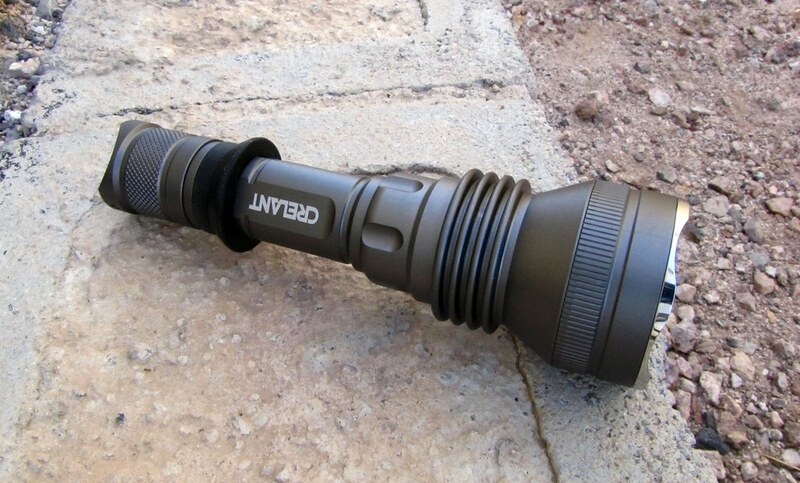 Other than an odd driver issue and a less than ideal UI, the Crelant V9-T6 is a good flashlight. I also feel that it is overpriced by about $10. Driven to a little over three amps, with a better tint and with a solid 3-mode UI then, perhaps it would be worth $42.60. 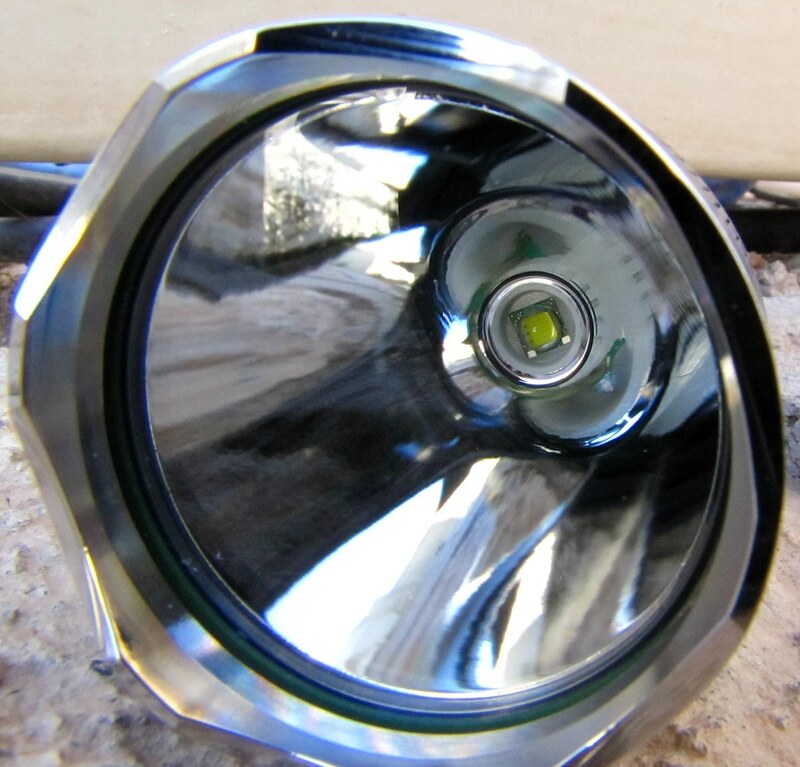 I sent this light to E1320 for a driver swap and more output. He had a hell of a time getting the old driver out and ended up using a dent puller. After all that I thought the light would be all messed up but it arrived yesterday with not a single scratch. The thing I love the most about how E programmed this driver is the super low moonlight. Is absolutely the lowest low I have ever seen. It's also a lot brighter than it was. The V9 feels as good as it looks. 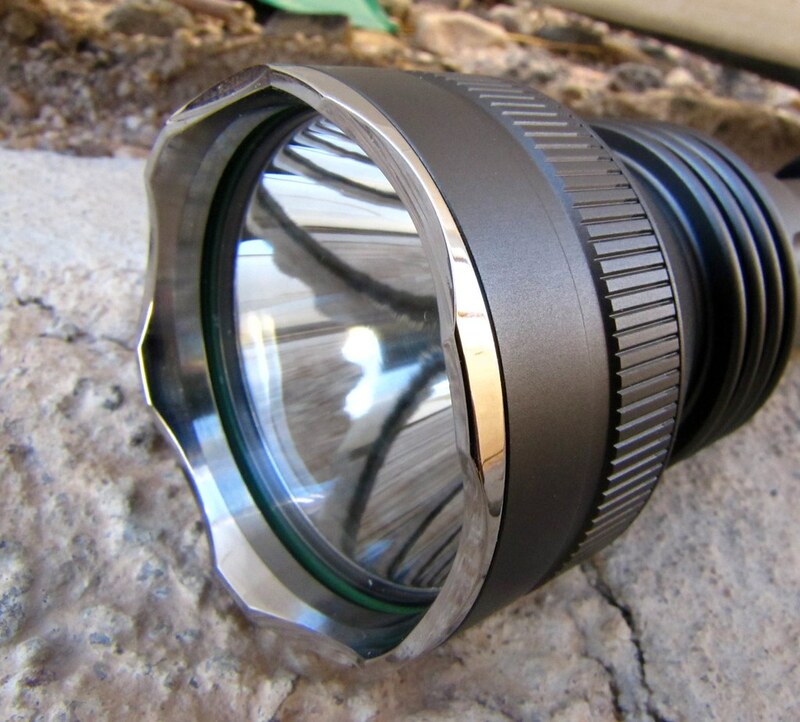 No new design frontiers being explored here; just a well balanced flashlight with enough detail interest, but not too much. It's not overwrought but the four thickish fins, six divots around the "collar" and classic-cut, sharp angled head are upscale and I'm a huge fan of the no-knurl body . . . The rubber grip/impact rings suggest weapon light but I'm not sure the 3-mode/flashy UI will appeal to the gun crowd. The scalloped edge on the tail cap in this shot may appear damaged. It is not but I do like the two side holes that allow tail standing with a lanyard installed. 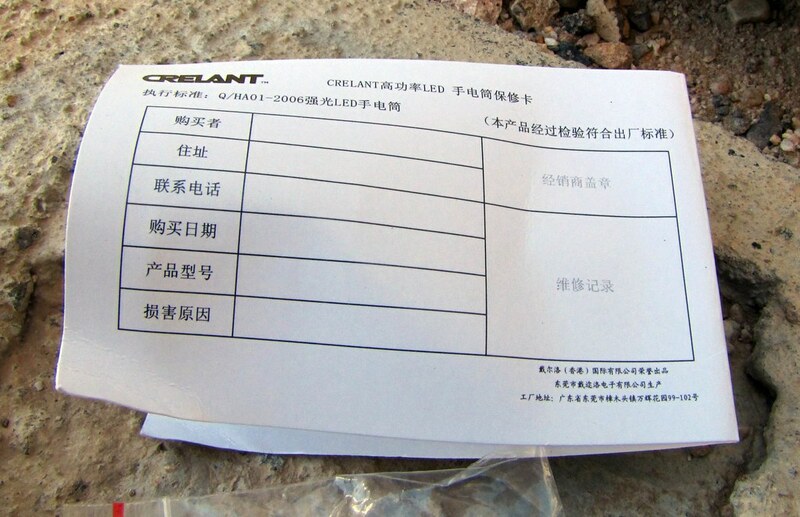 The V9 is branded "Crelant" but Int'l Outdoor's site says the manufacturer is Tiablo. Either way, this is a quality piece, inside and out. Crelant.com says the V9-T6 will run 120 minutes on high with an 18650. 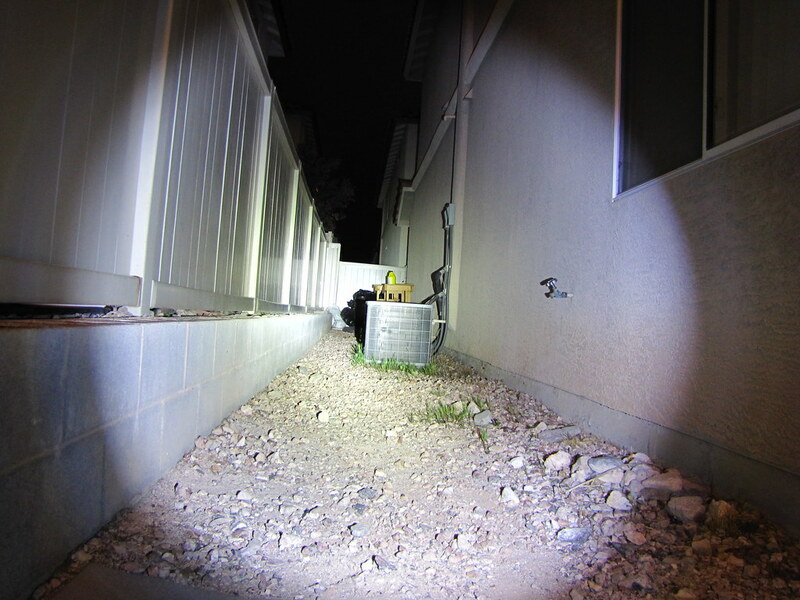 I got an hour and a half with a Panasonic 18650 that probably needed a charge so, it might be possible. The light never dropped out of regulation during my "test." 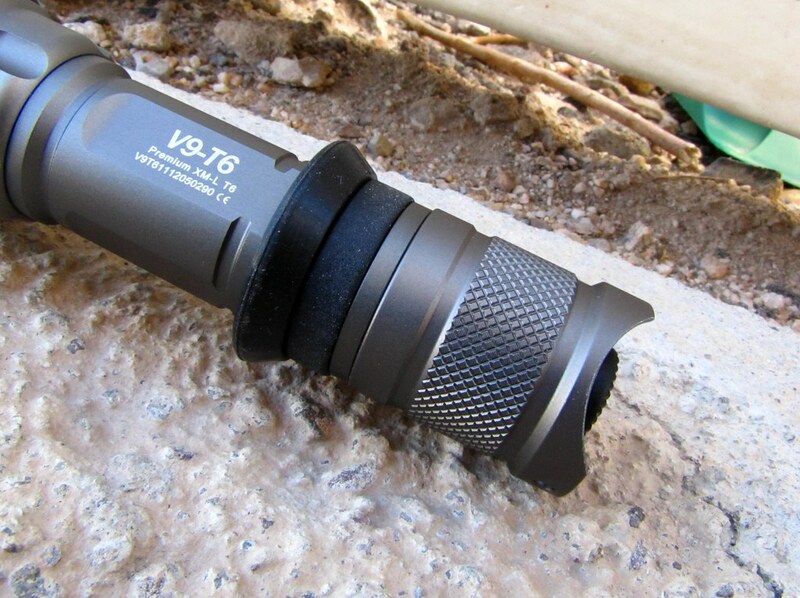 The V9-T6 will calm the centered emitter huffys and the smooth reflector is gorgeous. One thing about the bezel . . .
. . . those lines in the scalloped part of the bezel are not reflections; they're some kind of tool marks. They are also very slight and quite smooth. As you can see, machine work is flawless, as is the anodization . . . I think this is one of the prettiest tail caps I have ever seen. The tail cap threads are square and feel great but a pet peeve of mine is insufficient threads . . .
. . . as in, three up front and two back here is just not enough. I don't like a tail cap or body that falls off with barely two turns. It feels cheap. Foy doesn't like to feel cheap. Especially at $42.50. I didn't pry the star cover off because I fear an unintentional de-dome event with blood. It's two wires and some solder so, move along, folks. 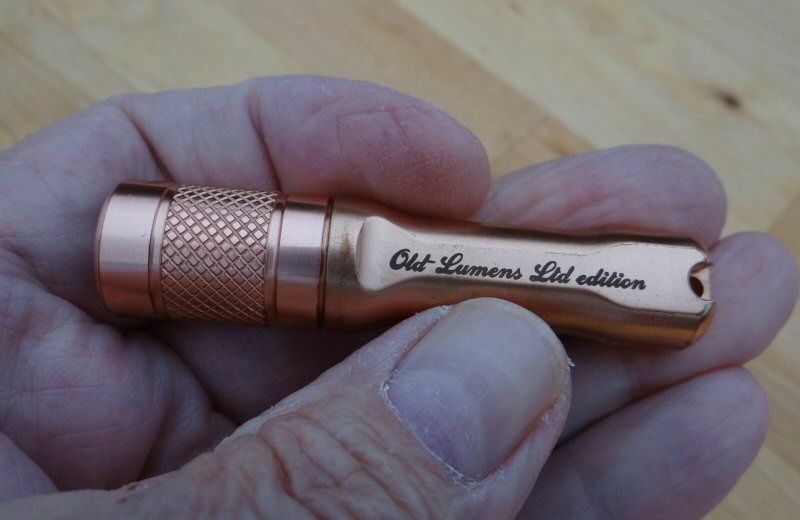 Handy web address reference and another example of the fine workmanship that defines this torch. That's an unprotected Panasonic 18650 in there . 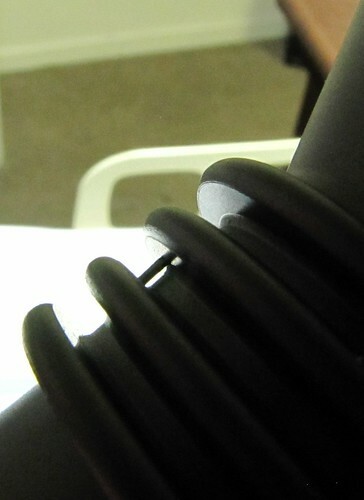 . .
One thing I do have to mention is this little square of metal wedged between fins 3 and 4. At first I thought it was just some cardboard or something . . .
. . . but it was a piece of aluminum pushed in there real tight, and before the anodization process. When it finally came out, I was left with this adorable little birthmark. With so many errant V9s around, it's a relief to know I can quickly identify mine in a lineup. More bad news; I hate the tint. On the left is a garden variety 3-mode UltraFire XM-L from Manafont in an L2P. At right is the Green Hornet Crelant V9-T6. Under many conditions this is not an issue but I must say, it makes the dry ground around my house look damp and mossy. At least the beam profile is great. Which brings us to the beam shots. All pictures were taken with a 1/4 second shutter speed @ f2.8. 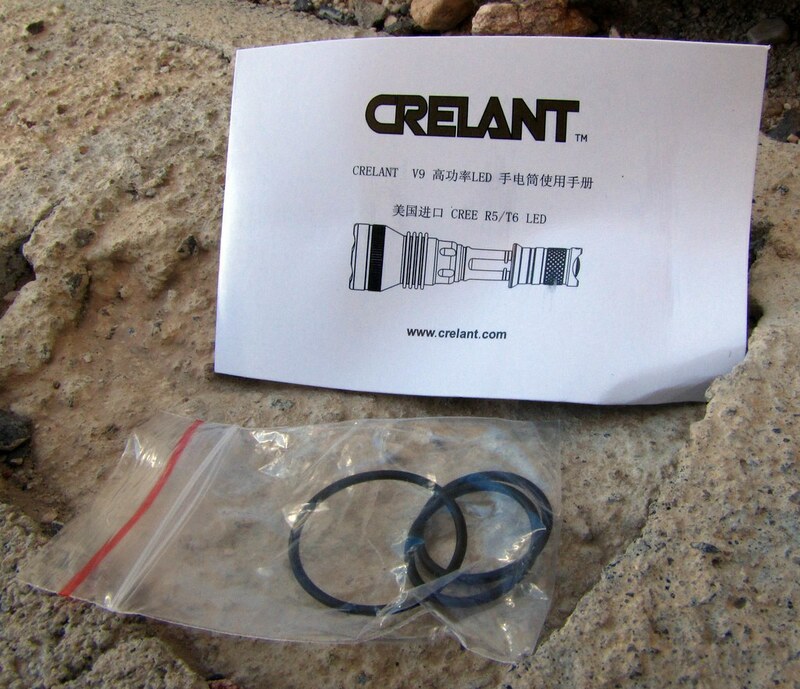 Crelant V9-T6 . 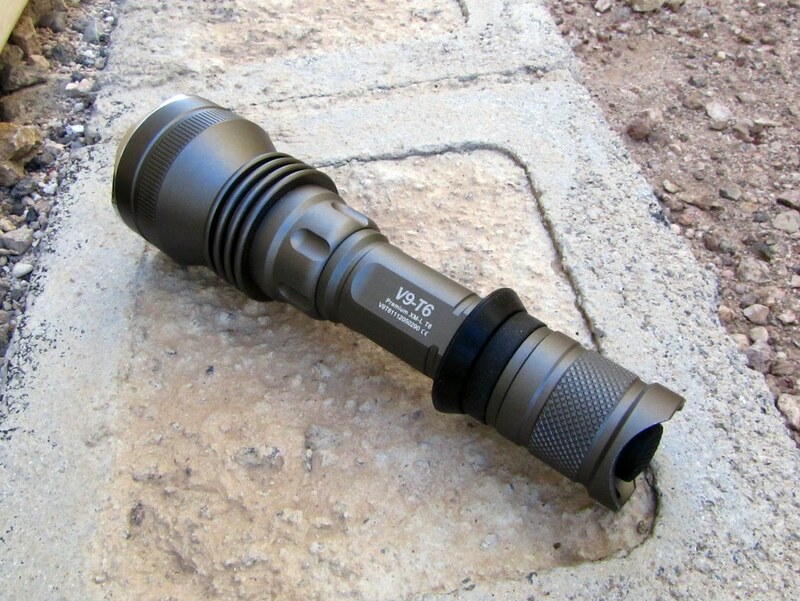 . .
L2P with an UF XM-L drop-in. You can see that the tint issue is no small matter. Either that or Foy is slowly becoming the tint snob he previously made fun of. Funny business 101. 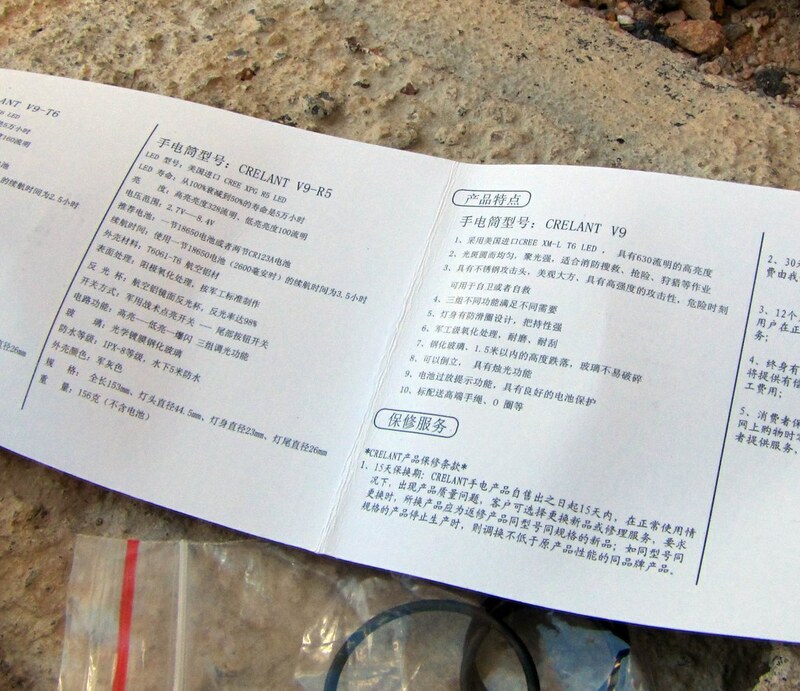 Here is the V9 instruction manual, apparently good for the R5 version as well . . .
. . . I found the clearly worded directions most helpful . . .
. . . and this handy trouble-shooting chart that should make diagnosing common issues a snap. It's a great light that I'm proud to own. I just think $40 should buy some more beans under the hood. Beautiful photo's foy and a great review. It's a pity about the tint and output. Thanks, Foy! Excellent review. I agree, it's a gorgeous light. And I think I can relate - I finally bought a TF ST-50 a month or so back for one reason only: I loved its looks. 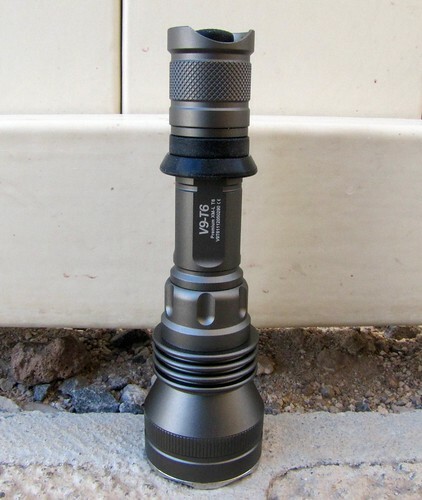 I had wanted one since I first saw a picture but I simply had no need for a SST-50 light so I held off until I found a deal that was too good to pass up. Now, I like it and in a way, I'm glad I bought it but I don't think I have used it for more than an hour tops. I do play with it from time to time but I won't even pretend it wasn't a waste of money. It's like the male equivalent of buying your 60th pair of shoes. I see terrible green tint, tooling marks on bezel, short threads that over time may fail, sloppy work with the metal piece stuck between the fins. Underdriven but you can take that as a positive or a negative. Nice review for pointing all of those things out. Don't think this one will make the short list. Good job Foy. I've got three questions Foy.. how much have you spent on flashlights in the.. last 12 months or so? 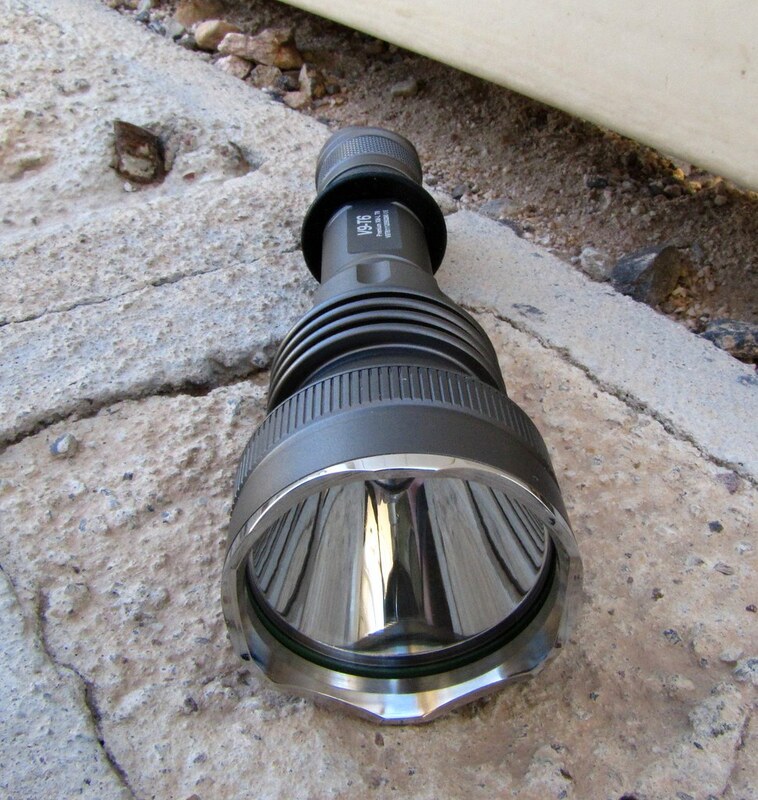 And have you found a thrower you prefer over the UF980L by now? Have you ever noticed that you got profile number 404? Heh, that's pretty cool. I wonder who is going to end up with 127001.
would have to be somebody local. You have nice pics & reviews always! Thanks! that you do an excellent review and awesome photos! I am sure I never want to send you one of my lights. I wouldn't want your photographic ability unleashed on one, where everyone could see the faults. Really great close up photos Foy! What is a profile number? 404? Probably something I should know . . . .
404 is "not found" http code that any web server returns if it cannot locate the resource (web page) a browser is trying to get. It's just a "happy" coincidence you are user with id 404, the same as the http code. 127.0.0.1 is the localhost IP address, a means for each and every network device to reference to itself. Wikipedia and google could help you learn more about that, but I'm guessing even this is more than you want to know. So you are user number 404. And when it comes to web site servers, when users attempts to follow a broken or dead link, they get one of the most recognizable errors users can find on the web: A 404 error. EDIT: viktori beat me to it! And I didn't catch the 127001 joke until it was pointed out. I've seen that 404 message for years . . . Foy is a bit slow on the uptake. I didn't even know we had a unique number . . .
And, I forgot to answer NightCrawl's question. My go-to/bump-in-the-night light moved from the 980L to my E/F-15 and although they both have terrific throw, I have other lights that fill that role better. The 980L spends a lot of time on the shelf, lately. Credits to the big bang theory. I love your reviews and I even like that light.. but I feel I have spent way too much money on flashlights from which most havent even arrived yet..
And sorry for OT-ing this thread and even though I put myself in danger of spending even more money, do you have a link to the E/F-15 and can you name your best thrower/s? Just awesome what you contribute to this. I got the F15 from Manafont some time ago and I see today the only one they have now is a P7. I apologize for calling it an E/F-15 . . . I thought it sounded cool. 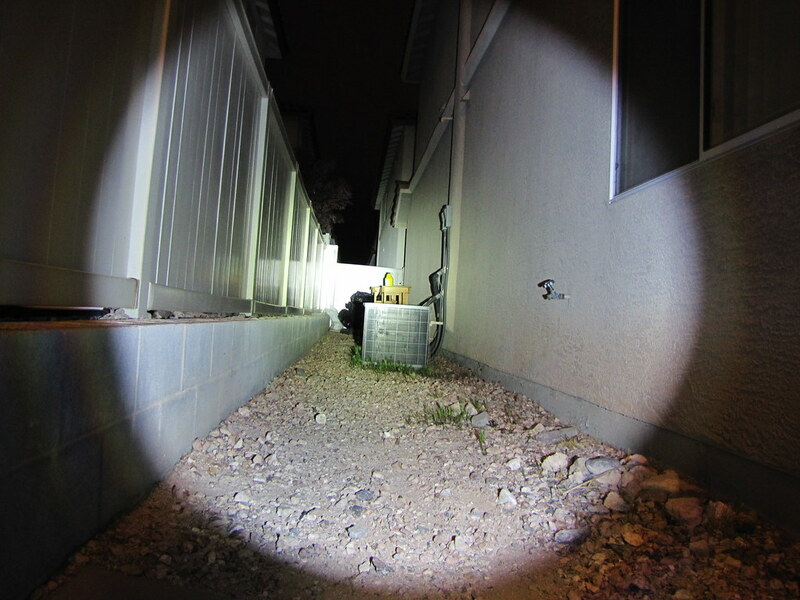 A few of us sent our TrustFire F15-T6 flashlights to member E1320. I call Erik "E" sometimes and instead of calling it the E1320 modified F-15, it is now dubbed the E/F-15. Similarly; the clumsy E1320 modified MCU-C88 becomes the hip E/C88. 4B tint XML( .02, .09, .65, 1.5, 3.15 ) amps with memory. Erik also made me an awesome P60 dropin . 3D tint XPG R4 ( .002, .06, .325, .67, 1.4 ) amps with memory. That particular dropin lives in a 501a powered by an 18350 . The firefly low is very cool . 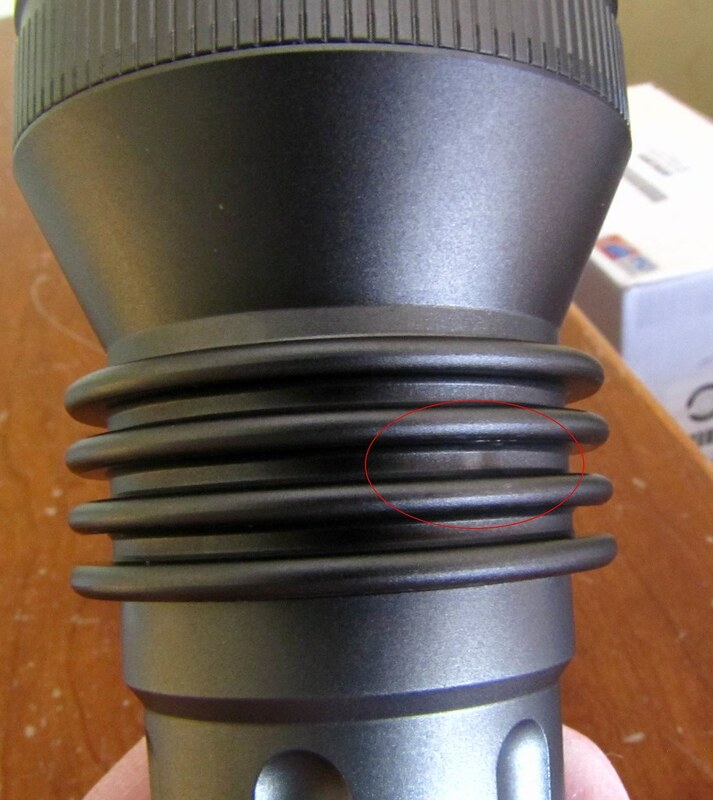 Don't keep buying lights . 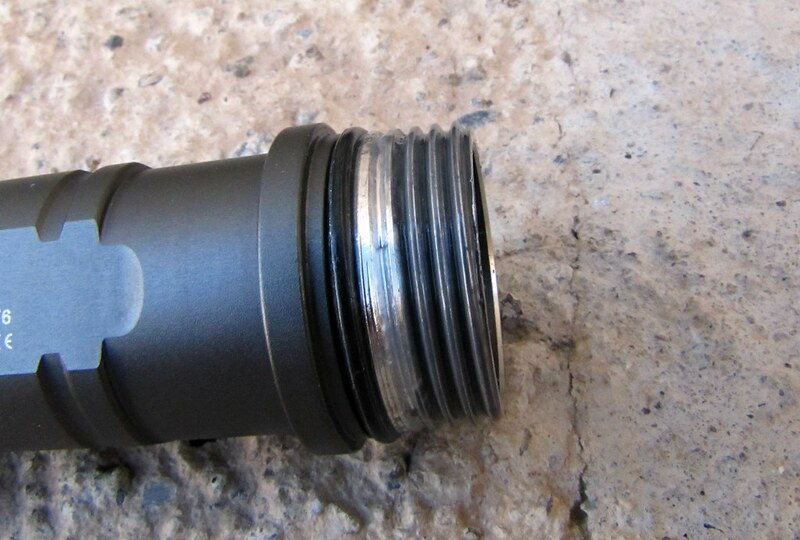 Have E1320 make your existing ones better . I can't say enough about the moonlight mode. You can just about stare right at the emitter and PWM is very slight. And, don't get me started about the C88 . . . Thank you for that post Foy, that made it clear now. It's so hard.. I always think "yup, those are enough flashlights".. meh. Very well done. Frontpage'd and Sticky'd. Sorry for the delay! My number is 530? Does that mean anything? In FTP error codes, the 530 means "Not logged in"
I have a copy of the 9V and I can say without a doubt that mine does not have any green in the tint. 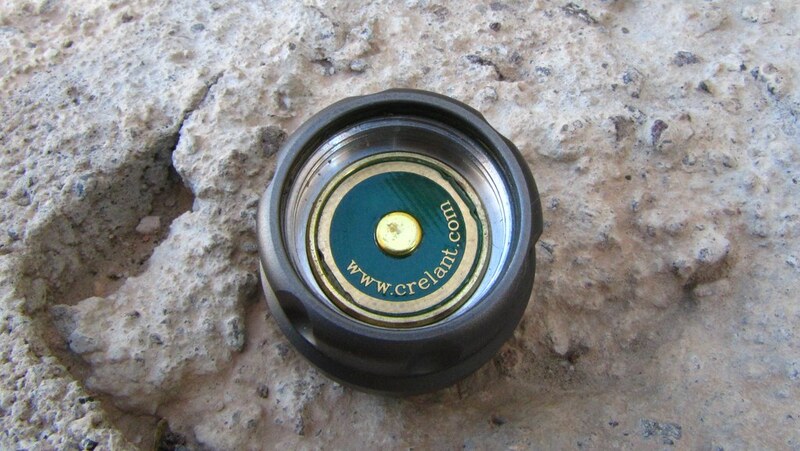 Crelant has also told me that they can ship the light as a single mode and that a pressue switch is available. My copy does not seem to have a lack of threads. 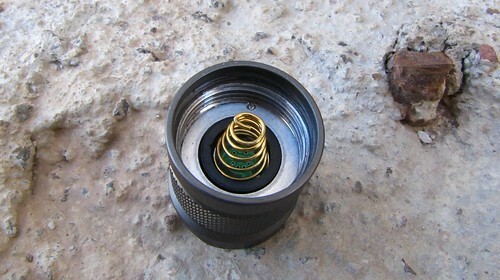 It takes about 4 turns to remove the tail cap. I'm glad to hear your (madecov) V9s (9V ?) have a better tint and more threads. 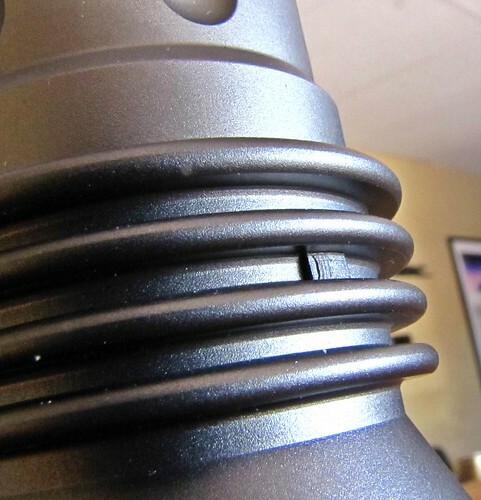 Small issues but, present on my light so, had to be said. This looker is another among my shelf queens . . . . if anything, the Crelant V9-T6 gets better looking the longer I have it. It is honestly, the prettiest shade of grey I have ever seen and on the rare occasion I have a (new) visitor in my office, it is the first light people ask about/want to touch. I'm seriously thinking about letting Erik violate it with an intake/cam/heads/headers upgrade. 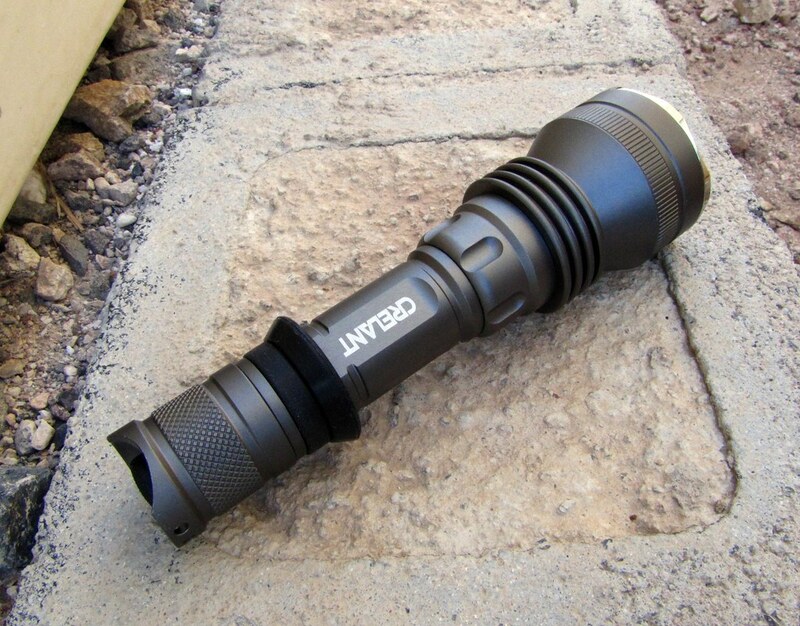 Can you imagine this torch with a simple 3-mode UI at 3.5 amps? That's it - time to wake this beauty up . . . .
I’m glad to hear your (madecov) V9s (9V ?) have a better tint and more threads. Small issues but, present on my light so, had to be said. This looker is another among my shelf queens . . . . if anything, the Crelant V9-T6 gets better looking the longer I have it. It is honestly, the prettiest shade of grey I have ever seen and on the rare occasion I have a (new) visitor in my office, it is the first light people ask about/want to touch. I’m seriously thinking about letting Erik violate it with an intake/cam/heads/headers upgrade. 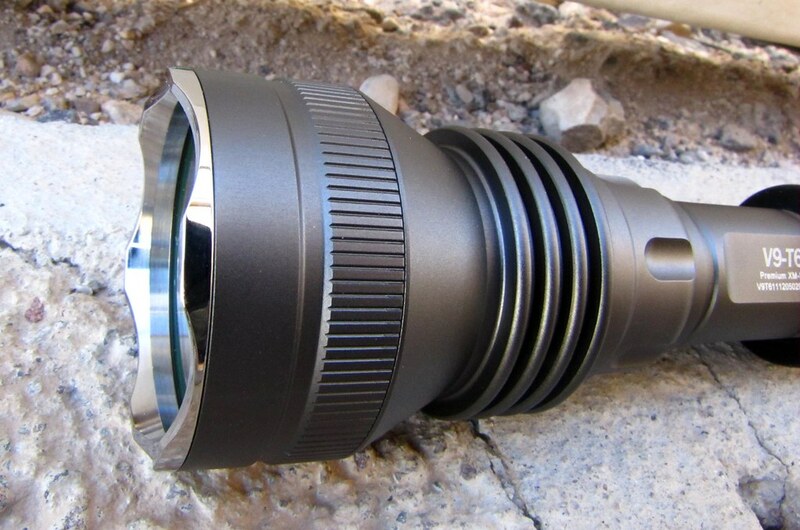 Can you imagine this torch with a simple 3-mode UI at 3.5 amps? That’s it – time to wake this beauty up . . . . Sounds like a stage 1 upgrade is in order. 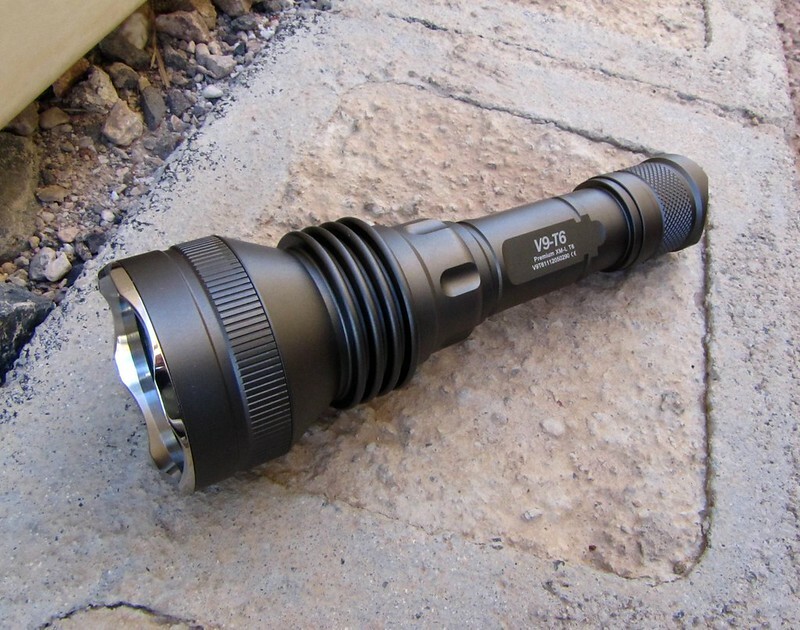 I've always been very fond of this extremely handsome torch and after E put in the supercharger (driver upgrade) Foy's example might be the brightest V9-T6 there is. It is seriously bright and as I may have said before, its performance now equals its fine appearance. 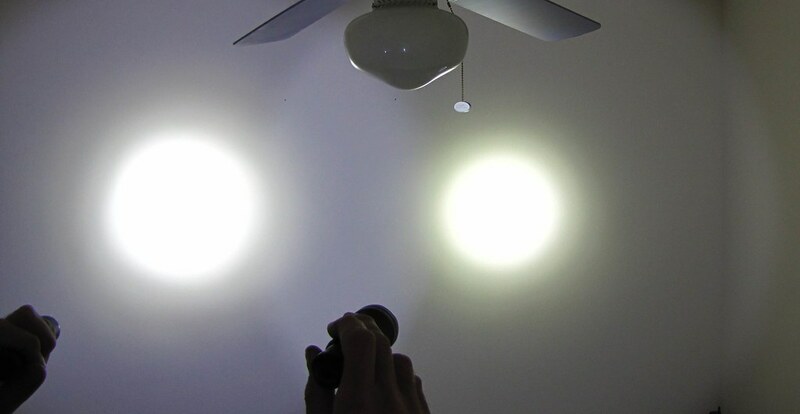 I don't use it much but it is still one of the best looking and now, best performing C8 light I own.